Exciting things are happening behind the Muscarelle Museum of Art’s signature primary colored light panels. This topnotch teaching and learning space is William & Mary’s most comprehensive classroom. Muscarelle’sO interdisciplinary approach to showcasing both contemporary and ancient exhibitions is creating a seamless cohesion between academia and the arts. With Leonardo da Vinci on display and student employees and interns organizing campus-inclusive gallery opening events, the museum is becoming a cultural hotspot for the College and the surrounding Williamsburg community. What makes Muscarelle’s recent success so impressive is the establishment’s complete turnaround over the past decade. In 2002, College funding for the museum was slashed by 90 percent, leading to concern for its survival. Three years later, Aaron De Groft ’88 returned to his alma mater to become the museum’s director and CEO, wielding a resolve for reinvigoration. Rather than isolating the space as its own institution, he envisioned exposing the Muscarelle as a vital artistic entity of the College. After presiding over the galleries and its goings-on for 10 years, De Groft’s dream of a thriving hub for curious students, faculty and all Williamsburg residents has evolved into a reality. The Muscarelle is fostering relationships with multiple academic departments and nurturing an invaluable internship program for students. Breaking Boundaries: The Muscarelle recently showcased “Tree to Mountain: The Woodblock Prints of Toshi Yoshida,” an exhibit combining intern event planning, a partnership with William & Mary professors of history, and work done by students in a curating course. Students across differing disciplines are engaged with the museum’s inner workings. In addition to intern positions, a curating class is offered each semester as a seminar course under the expertise of Assistant Director and Chief Curator Dr. John T. Spike. The class provides its students with tangible access to the museum, the ability to be directly involved with the research and production of a full-scale exhibition, and the chance to work closely with museum staff and other faculty members. In the fall of 2014, Muscarelle showcased “Tree to Mountain: The Woodblock Prints of Toshi Yoshida,” an exhibit combining intern event planning, a partnership with William & Mary professors of history and art history, and work done by Spike’s curating course. Guest curators Hiroshi Kitamura and Xin Wu assembled the exhibit on behalf of their respective departments, bringing together scholarly studies and the visual impact of Muscarelle’s gallery space, to create a collaborative cohesion of creativity. Internal Affairs Coordinator Laura Wood ’15 organized a student-friendly reception to celebrate Tree to Mountain as well as Kabuki Theatre Woodcuts, another Japanese showcase, this one put on with help from the College’s Theatre Department. “Kabuki to Sushi” invited W&M students to peruse the galleries, mingle among the art pieces, and enjoy sushi and wine samples. More recently the museum hosted a “Simply da Vinci” soiree, complete with a red carpet entrance, gourmet snacks and live musical performances to commemorate the opening of one of Muscarelle’s most prestigious exhibitions to date. Despite uncooperative weather that drove the event completely indoors, a crowd of over 1,000 attended the gala, easily cementing “Simply” as the most well-attended student happening in recent years. Muscarelle’s student employees and interns are fundamental elements that ensure things run like a well-oiled machine. Undergraduate contribution to the museum extends outside of its flagship location on Jamestown Road. 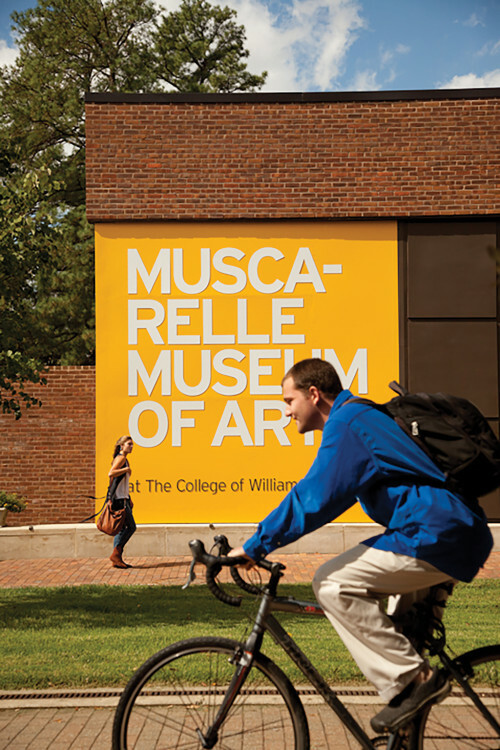 The Muscarelle Museum Annex at William & Mary’s Sadler Center offers the opportunity for any campus cause or alumni association to showcase a collection that represents its interests and inspirations. Past displays include a photography exhibit sponsored by the social and cultural campaign Humans of William & Mary, as well as an exhibit of paintings by Jeanne Weaver, in memory of her son Lt. Todd W. Weaver ’08’s passing while serving in Afghanistan. These mini exhibits in Sadler further the museum’s integration into the College as a whole, allowing faculty, students and visitors a chance to be immersed in its outreach. Ursula McLaughlin ’99 is on the Muscarelle’s staff as its special projects administrator, a job that involves managing the Annex. Let’s Get Together: The Muscarelle Museum is an integrated part of academic life across all disciplines, offering first-hand research through collections and traveling exhibitions. Departments such as biology, Chinese language, classical studies, environmental science, government, history, international relations, law, marine science, music and theatre have all partnered with the Muscarelle. A 2012 photography exhibit exposing the deformities inflicted on the human body by mercury poisoning was a shared effort between the museum and approximately 15 of the College’s academic branches. The Matilda of Canossa collection presently available was made possible by joint efforts from Muscarelle and William & Mary’s Marshall-Wythe School of Law. Fundraising affairs like the upcoming fifth annual Wine & Run for the Roses auction and Kentucky Derby viewing party keep the museum’s monetary backing up to speed with its constant progression. Proceeds from this event benefit education and research opportunities available through the museum, such as docent-led gallery tours and an ongoing series of lectures given by nationally and internationally recognized specialists which are free and open to the public. A notable upcoming research-based retrospective at the museum will explore W&M’s Brafferton building and its anthropological and historical significance to the College. The showcase is being curated by Danielle Moretti-Langholtz, Muscarelle’s adjunct curator for Native American art, and will be unveiled in 2016.